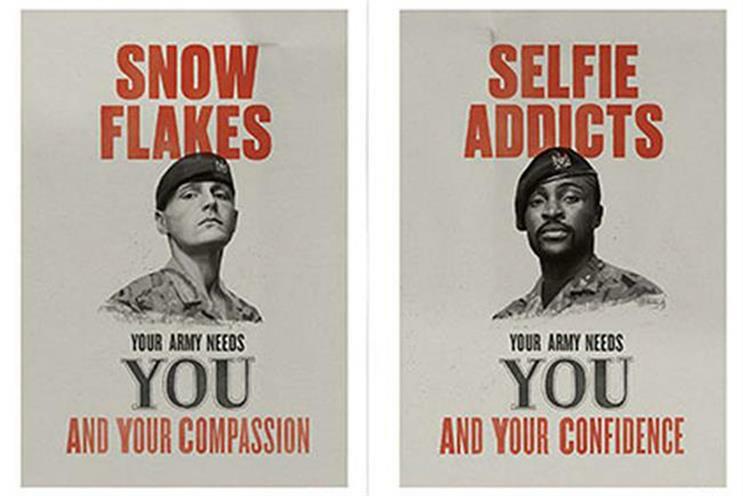 Recruitment ads called for 'snowflakes' and 'selfie addicts' to join the army. Campaigners have accused the Army’s "Your Army needs you" recruitment campaign of targeting young people with "January blues". The Guardian reported that a briefing document for the campaign showed that it had specifically been timed to run on TV during the weekend of 5 and 6 January, when people are supposedly less happy following the festive period. MediaCom handled media planning and Manning Gottlieb OMD was the media buying agency. The document also appeared to show that the work is focusing on cities in northern England and south Wales, as well as people from C2DE – the lowest three socioeconomic groups. Created by Karmarama, the campaign aimed to target young people by subverting stereotypes about them. It depicted how "snowflakes" and "selfie addicts", for example, would be beneficial traits for the Army. Charlotte Cooper, UK research and campaign officer at Child Soldiers International, told The Guardian that the Army is continuing to exploit young people’s emotional vulnerability. However, Colonel Ben Wilde, the Army’s assistant director of recruiting, said: "Like all modern national recruitment campaigns, our adverts are designed to reach a broad range of audiences. This enables our armed forces to be representative of the nation they help to keep safe. "It should be no surprise that a national recruitment campaign would focus on major population centres across the UK, or increase activity in the new year when individuals are looking for new roles." Has the Army recruitment campaign missed its target?